This high tech space contains plenty of room for experimentation and discovery. It is equipped with a SMARTBoard connected to a pc and laptop hookup. The large projection screen, numerous electrical outlets, and sinks provide the perfect space for math and science instruction. Video Observation System(VOS) equipment and wireless connectivity are also available. This room is supported by trained support staff, available on demand. Rooms without this feature are NOT guaranteed support until the next business day. 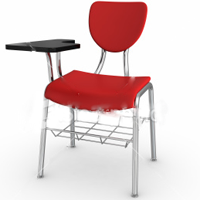 Room features an Interactive White Board (IWB), typically a SmartTech IWB (SmartBoard). This device allows instructors to intuitively interact and manipulate the rooms presentation machine. This room allows instructors to connect their personal laptop up to the projector and sound system, switching to the input using the wall mounted control panel. Laptops are available for use in this room. An instructor/presenter station is available for use in this room. Room is equipped to record class session using the Video Observation System (VOS) by a simple press of a button. More details of VOS can be found here. Room has hot and cold running water available for use. Access to UM Saint Louis' wireless broadcast (TritonNet) is available from this location.